Everyone has something to celebrate. You could have an important birthday coming up, a special anniversary, a graduation or a wedding. 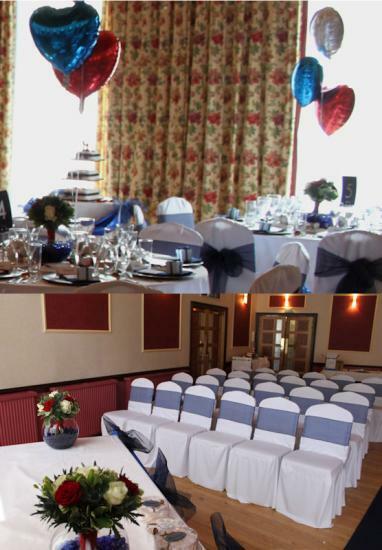 No matter what your special day is Mackays Hotel will help you celebrate it. Our unique Celebration Fair in Mackays Hotel will feature a host of exhibitors who can help with any special day. We have magicians, photographers, florists, jewellers, bridal wear, car hire and bakers all ready to chat to you and showcase their skills. The fair will take place on Sunday 27 February from 12pm until 4pm in the function suite and dining room in Mackays Hotel. The fair will include a fantastic walkthrough where models will mingle with guests and answer any questions they may have. Bridal wear, lingerie and children's outfits will be on display - don't miss it. Come along and hear how Mackays Hotel will tailor your event to YOU, have a peek at our bridal suites, see the fantastic exhibitors, taste some scrumptious food and finish off with our chocolate fountain. Don't miss out on the special offers! Proceeds from the price of the exhibitor stalls and donations will go to local charities. WINNERS OF HIGHLAND BUSINESS AWARDS 2016 ANNOUNCED. Pultneytown Peoples Project and Mackays Hotel. Health and wellbeing has never been further up the agenda with the introduction of sugar tax, statistics on obesity levels in our future generations and the increasing attention being paid to our metal health. Caithness is set to play its part in raising awareness and looking at alternative ways to live our lives with the return of a wellbeing festival aimed body, mind and spirit. Early in February the first two in a series of workshops specifically for anyone working in the local food and drink sector will take place to highlight how social media can be best used to increase profit, support other local businesses and promote the area. The workshops follow on from the project The Highland Council ran last year across the Highlands to investigate the potential and appetite for developing an industry-led local food and drink network that could co-ordinate and drive future activities to support the local food and drink sector in the region. The Highland Council is to take a lead role in helping businesses save money, be more competitive and reduce their environmental impact by using resources more efficiently, by backing the national Resource Efficiency Pledge scheme. The Resource Efficiency Pledge is a new scheme from Resource Efficient Scotland, a programme of Zero Waste Scotland which works with businesses to help them reduce both their running costs and carbon emissions. Inspired by the success of the London 2012 Olympics� Gamesmakers, Mackays Hotel in Wick has become the latest organisation in the UK to gain national recognition for its dedication to excellent customer service, joining an elite segment of hospitality businesses that have achieved the status. The family run hotel received news this week that it is the first hotel in Caithness & Sutherland to be awarded WorldHost Recognised Business status, a training programme that was used to train the tens of thousands of staff and volunteers for the London 2012 Olympic and Paralympic Games, and nearly one million people worldwide, in exceptional customer service. Mackays Hotel is delighted to announce in collaboration with Richards Garage car hire vehicles will be available from the hotel outwith normal working hours, including Saturday and Sunday. Murray Lamont, of Mackays Hotel, commented that he felt there was a gap in the market and particularly on a Sunday when there was no public transport to John O'Groats. A great evening is ahead for the folk who attend this cocktail dinner at Mackays Hotel in Wick on 7th April 2012. .
Brides-to-be heading along to Mackays Celebration Fair will receive a special treat if they book the hotel for their wedding on the day of the Celebration Fair�a free luxury wedding car for their special day*. In the one-of-a-kind Celebration Fair, on Sunday 7 November from 12 - 4pm, the hotel will ask guests what they are celebrating and will cater for birthdays, anniversaries, graduations, Brides-to-be heading along to Mackays Celebration Fair will receive a special treat if they book the hotel for their special day�a free luxury wedding car. Mackays Hotel asks - 'What are you celebrating?' Everyone has something to celebrate. You could have an important birthday coming up, a special anniversary, a graduation or a wedding.